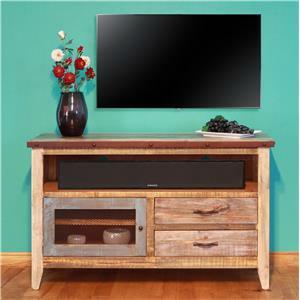 Enhance your living room with this rustic TV console. 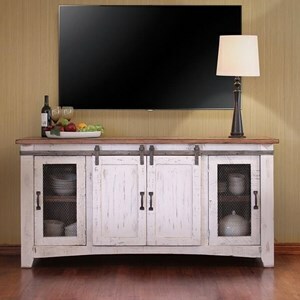 You're sure to appreciate its textured two-toned finish, hanging door pulls, and framed drawer fronts, as well as the convenience of its concealed storage space and two wire management openings. 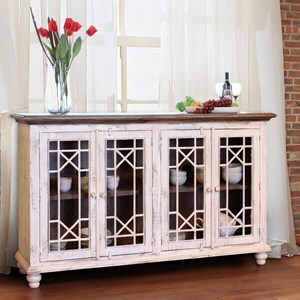 Thanks to this stylish and functional design, you'll love having this piece in your home. 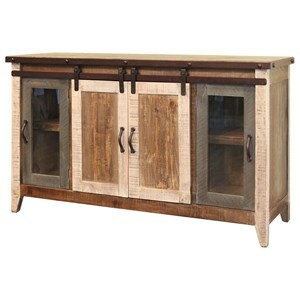 The Laguna Rustic Console with Glass Doors by VFM Signature at Virginia Furniture Market in the Rocky Mount, Roanoke, Lynchburg, Christiansburg, Blacksburg, Virginia area. Product availability may vary. Contact us for the most current availability on this product. 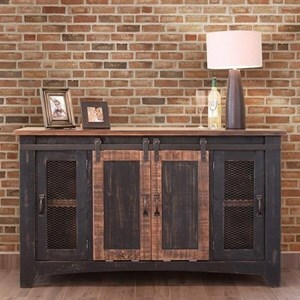 Give your home the gift of quality rustic style with this collection of occasional tables. 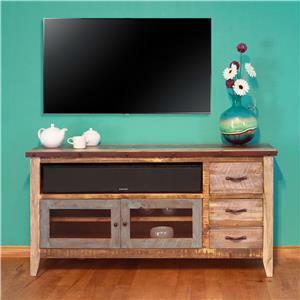 These pieces are made from solid pine with a multi step lacquer finish to ensure they look great for years to come. Plus, the tables and console all feature drawers with metal glides and dovetailed drawer fronts, so their storage is sure to stand up to the test of time as well. 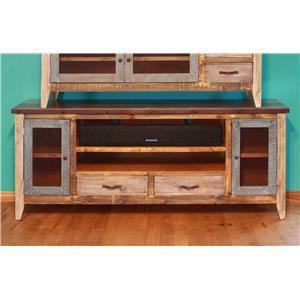 The Laguna collection is a great option if you are looking for Rustic furniture in the Rocky Mount, Roanoke, Lynchburg, Christiansburg, Blacksburg, Virginia area. 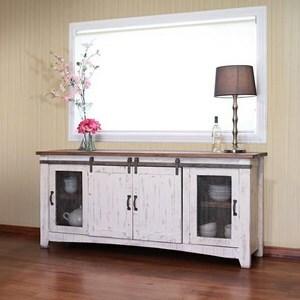 Browse other items in the Laguna collection from Virginia Furniture Market in the Rocky Mount, Roanoke, Lynchburg, Christiansburg, Blacksburg, Virginia area.